And the animation is alright, but everything else, not so much. The voice acting was particularly grating, especially when it came to the kids. Maybe it will get better as it continues and I'll have to change my rating, but for now I am not eager to see anymore. Animation is okay, but the angles they use really highlight the bad lip syncing. Character designs (esp of the mechanical eye guy) are EXTREMELY overdesigned. He doesn't need 4 unique identifiers (eye, face tatoo, mechanical arm, etc). Pick 2. Voice acting needs to be redone. Varies from tolerable to horrid. The animation may trigger people as it seems "weird", but that is not an issue if you are use to the Boondocks and Black Dynamite, shoot even Afro Samurai. The character design is actually nice. They are well drawn, and the voicing, even if in English, is not awful. Best of all, the Spanish in this anime is not butchered (Gracias a Dios/Thank God). The voice acting may also trigger people, but it feels genuine an makes characters feel more relatable. The pacing is weird in the first episode. Feels like a quick run down of what transpired before and what is currently happening in the present. While trying to stuff as much as possible into 14 minutes while also making the characters feel "alive" by creating human beings that are being fleshed out as you watch. The background artist, she is FREAKING great. Makes NYC look quite nice even if it is a dystopian alternate timeline. The background music is great too. Especially during the credits, and it is a GREAT stylistic choice reminiscent of Boondocks and Samurai Champloo (Rest in Beats Nujabes). Watch the average Japanese Anime and then comeback, you will notice little to no actual difference if you pay attention closely (DBZ in general, In Another World With My Cellphone in genera, Bleach's moth movements especially, Lucky Star even though that was freaking great, or My Teen Romantic Comedy Snafu which had it's weird animation issues that killed it for me even if the anime itself is good). So the point is, animation is expensive and most shows have some issues that we either ignore or we can't, depends on the person and their preferred taste and either it kills it for you or it does not. I will like to see more. I don't expect a 5 star anime, but i do expect to be very well entertained. The first episode is short (under fifteen minutes). The show is definitely has more of a western animation feel but that isn't anything bad. It feels as it has some inspiration from boondock saints and legend of Korra. Whether the series will become something more we will have to wait and see. As more episodes come up I will update this review. For now I definitely recommend giving the first episode a shot. The voice acting in this isn't bad even though it's English (which normally is terrible). However, I absolutely hate watching anime with English voice actors...it just ruins it for me. A brown female protagonist of an Anime! thank you LeSean Thomas. In case you don't know LeSean Thomas is a character designer who has worked on Boondocks and Black dynamite among many other shows. He is working with crunchyroll to create this show. This review only pertains to the first episode and has no spoilers. The episode held my interest from beginning to end and I found myself entertained. The pacing could be better but the episode is pretty short at 15 minutes. I'm not sure why some people don't like the voices. The voice acting to me is pretty good and I don't have any complaints. LeSean Thomas is American so of course the voices are in English. I enjoyed the characters so far for what we got in 15 minutes and am looking forward to finding out more about Rhonda. So I say enjoy the action and a bit of mystery, with some good music and some beautiful backgrounds. 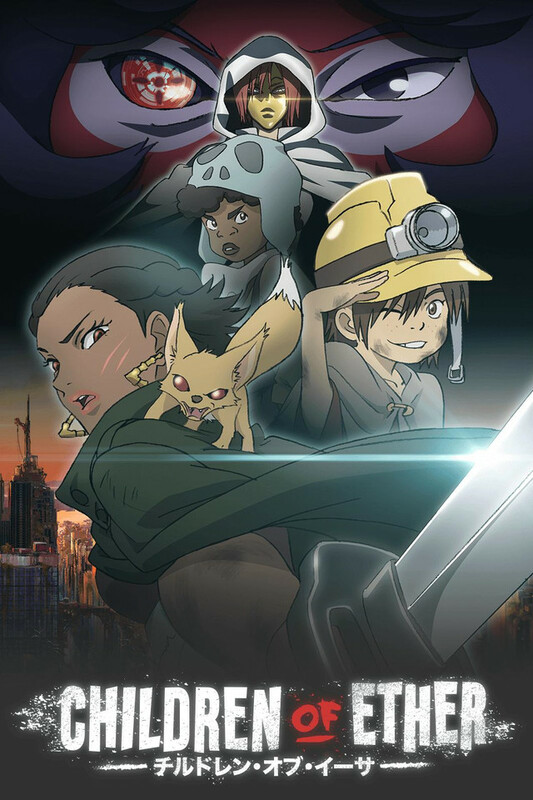 Part of Lesean Thomas world anime project children of ether has kinetic action and incredible character design. I wish it had more bright colors rather than the drabness of the post apocalyptic waste lands that we've seen . The world always needs more brightness especially in the darkest times the score is superb too. needs to expand a bit in the world building but and incredible effort. i want to see more voices mixing and creating new alchemies in the world of anime ! Voice acting is iffy in the first train scene, but smooths out over the episode, even with the kids. Animation is smooth during action and calm moments. However little was established in terms of plot, characters, or world, but it still looks promising enough in terms of production value to warrant giving a chance.